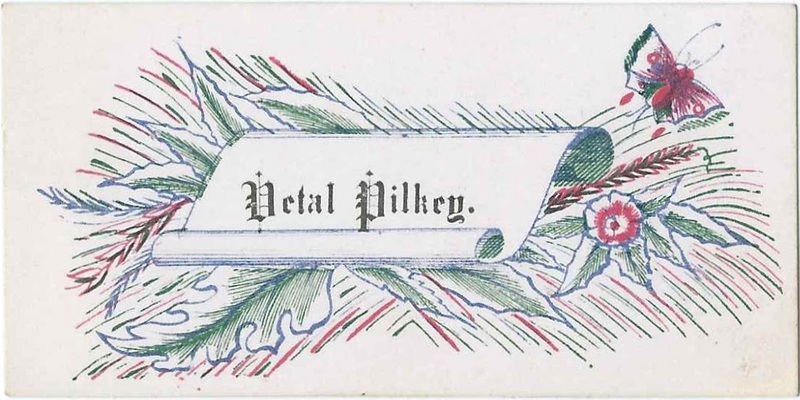 Calling card of Vetal Pilkey. I believe his surname goes back to Pelletier, presumably Acadian in origin. I found several possibilities for Vetal, in Piscataquis County, Maine; Aroostook County, Maine; and in the communities along the Maine and New Brunswick border, which was a bit blurry at that time. The card was found with other calling cards, most from central Maine, which might give some added weight to the Vetal from Piscataquis County, Maine. An 1851 Census of the District of Madawaska in nearby New Brunswick that lists a Vetal Pelletier, described as the son of Fermin Cyr. The 1850 Census of Van Buren, Maine, shows a Vetal Pelka, born about 1843, living in the household of Louis and Mary Pelka. The Census notes that Louis and Mary were natives of Canada, with the children in the household born in Maine. I believe this Vetal/Vital was the man who was farming at Van Buren at the time of the 1870 Census and was married to Genevieve, with whom he had several children. By 1900, he and his family were living at Lewiston, Maine. He was using the surname Pelletier. The 1860 Census of Township 17, Range 9, Aroostook, near Fort Kent, Maine, lists a Vital Peltier in the household of Beloni and Le Carte Peltier. Vital's death record shows that his parents were Belonne and Victoria (Violette) Pelletier. Vital was a farmer who was born and died at St. Francis, Maine. Born about 1842; died in 1912 of consumption. It appears that he used the surname Pelletier. An online tree indicates that Louis Pelletier and Marie (Dupont) Pelletier had a son Vital Pelletier, born September 10, 1843 at St. Basile de Madawaska, New Brunswick. How well sources this tree is I don't know. Another online tree shows a Vital Pelletier born February 7, 1843, at St. Francis, Maine, son of Nicholas Pelletier and Catherine (Dube) Pelletier. Again, how well sourced this tree is I don't know. Interestingly, a Civil War Draft Registration record dated August 6, 1863 lists Vetal Pelkie, born in New Brunswick about 1843, living at St. Francis, Maine, single and working as a laborer. Take this also with a grain of salt. Whether coincidence or not to the tree mentioned just above, a Vetal Pelkey served in Company E of the First Maine Artillery from August 1864 to February 1865, as shown on the 1890 Veterans Schedules of Greenville, Maine. A footnote indicates that he was experiencing "Loss of Health" and that he had been "Taken prisoner in Hospital". I found a Peter Pelkey in Company E, someone who was taken prisoner and died from wounds at an unknown date. I wonder if "Peter" was Vetal and his eventual death, years after the war, was attributed to the wounds he had received. The 1880 Census of Greenville, Maine, shows a Petal Pelkie, a Maine native, single and working as a servant in the household of Andrew Nutters. I'm leaning toward thinking the owner of the card was the Vetal of Greenville, Maine, based on the closeness of the spelling he used throughout his life and the fact that most of the calling cards in this collection came from central Maine. But I'd appreciate readers' thoughts. If you have a theory as to the identity of the Vetal Pilkey, please leave a comment or contact me directly.